Dew Claws on Dogs – Dewclaw Clipping: To Keep or Remove? You may have noticed your dog’s little toe that sits a bit higher up the leg, away from the bed of its paws. In some dogs, they are tightly attached, in other dogs they only seem loosely attached to the leg. These are your dog’s dew claws. You may have found this article because you are considering removing your dog’s dew claws. This article will help you understand what dew claws are, explore their function and which different types of dew claws there are. We discuss the pros and cons of surgical removal as well as the implications and costs of such a procedure. Dew claws are short nails on the site of the foot that don’t touch the ground. They are often referred to as a dog’s thumb, but they have a lot less purpose and value to a dog than a human’s thumb does. From an evolutionary perspective, it has been discovered that, around 40 million years ago, the cat-like animal miacis – a very early ancestor of modern dogs – needed all five toes for climbing trees. However, since then dogs have evolved and the physiology of their paws changed to allow for more speed when hunting on the ground. Dew claws are basically leftovers of the canine evolutionary process. The majority of dogs have dew claws only on their front paws, however some dogs exhibit dew claws on their hind feet, e.g. Newfoundlands. And in some cases dogs even have an extra toe which is often referred to as a double dew claw, or polydactyl (meaning “extra toe”) and is commonly found in breeds like the Briard, St Bernard and Great Pyrenees. In some dogs the dew claws are held tightly against the paw, in others they can be quite loose and floppy. These looser type of dew claws can cause a bit of worry for dog owners, as there is a risk of serious injury occuring. They can, for example, get torn off when the nail catches on something, as the dog runs through bush or over rough terrain. Some dog sports also pose a level of risk for dew claw injuries, e.g. agility and flyball. If a dew claw is injured, you will often find that the animal may limp and cry out when you touch its leg. If the claw gets caught and torn off, expect there to be a lot of bleeding. This is because dogs’ nails have quicks (the soft tender flesh below the growing part of the nail), which have their own blood supply. If your dog has injured its dew claws, it is best to take it to the vet. If it is torn but still connected to the leg, then the vet will probably cut it off completely. If it is broken, the broken part of the nail will be trimmed off. A bandage will be applied for a few days if there is a lot of bleeding or the nail has completely come off. Apart from the bleeding and being painful for the dog, these injuries aren’t too serious. Your vet will very likely give your dog some pain medications and antibiotics if needed to stop infections. Because they don’t touch the ground, dew claws do not get worn down on walks. 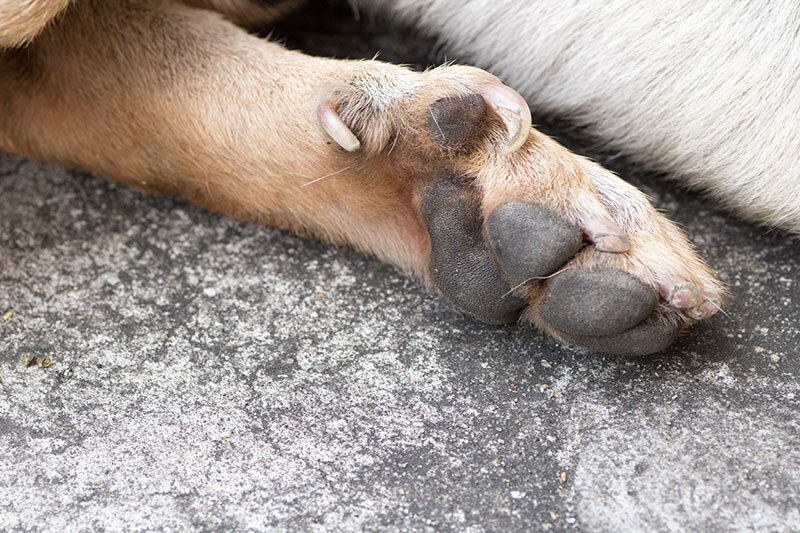 Keep an eye on your dog’s dew claws to avoid long toe nails becoming overgrown and growing into the toe pad. Use scissors or clippers that are especially made to trim your dog’s nails. With dew claws, it is best to separate them a bit from the leg to avoid cutting into the skin. Make sure you don’t cut into the internal nail area, which is called the quick. If the quick is too close to the tip of the nail it is better to wait until the nail is further away from the quick before cutting it. If you need further guidance, check out this detailed guide, written by a vet, on how to trim your dog’s toe nails. Our friends from dog training company, Dog Matters, have published an informative (and entertaining) video on how to trim your dog’s toe nails and what you can do to get your dog used to it. Like other toe nails, dew claws can get infections. This risk will be reduced. When is dew claw removal recommended? In countries like the USA, removing a dog’s dew claws is quite a common procedure and is even done preventatively at puppy age. The dew claws are frequently removed by breeders when the animal is only a few days old and the digit has not yet attached to bone or muscle tissue. The Australian Veterinary Association (AVA) however, has a more conservative view on dew claw removal, which it does not promote unless required because of a legitimate medical reason. It is seen as surgical alteration to the natural state of an animal, which is acceptable only if it is necessary for the health and welfare of the animal concerned. If you would like to find out more about this, please follow this link. In practice, Australian vets tend to recommend removing a dog’s dew claws if they hang loosely off the paw and provide a risk for injury. 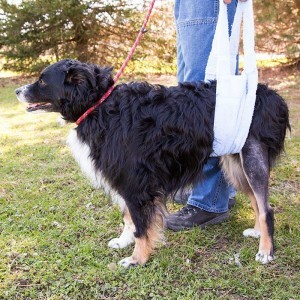 This is often recommended to be done when your dog undergoes a standard procedure such as de-sexing, where the animal will be put under general anesthetic. Step 1: Your dog will be put under general anaesthetic. Ensure that you follow any preparation guidelines your vet gives you, e.g. not to feed your dog anything on the day of the surgery. Step 2: To prevent infections, the skin around the dew claw will be disinfected. Step 3: The entire toe will then be removed with surgical scissors cutting quickly through skin, muscle and bone. Step 4: After the dew claw has been removed, the wound will be stitched up with dissolving or non-dissolving sutures. Step 5: To protect the wound, its is often covered by a bandage. Because their bones are still soft, and muscle tissue has not developed that much, dew claw removal is much simpler in young puppies, and is often performed when they are only a few days old. The surgery itself often takes only 15-30 minutes. Your dog may have to stay at the vet hospital for 2-3 hours and can return home once the anesthetic has worn off. If your dog bites or licks their paws, your vet will recommend that is wears an Elizabethan collar. The wound should be checked daily for redness, puffiness or if it causes obvious distress to your pet. If the sutures are non-dissolving, they need to be removed by your vet after 5 to 7 days. The most expensive part of the procedure is the general anesthetic. For this reason, the procedure is often combined with other surgeries such as de-sexing. 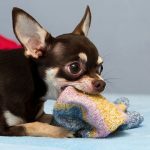 The extra amount that you would pay for the actual dew claw removal procedure is usually around AUD $70 or more, depending on your vet and your location. If you have opted for our Routine Care option, Bow Wow Meow Pet Insurance will contribute up to $50 for your dog’s dew claw removal* (conditions apply). Learn more about our Routine Care Cover. Removing your dog’s dew claws in most cases is not necessary if you keep an eye on them to ensure they do not get too long and prevent injuries when your dog is in rough terrain. 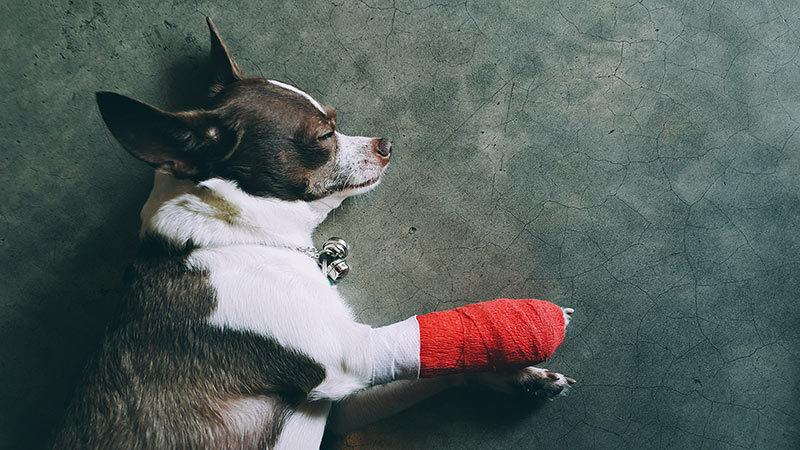 However, if you feel the dew claws impact your dog’s wellbeing and risk causing an injury, you should discuss the option of surgical dew claw removal with your vet. Especially with very loose sitting dew claws, this might be beneficial. The surgery itself is simple and in most cases requires general anaesthetic. Recovery time until removal of sutures can take up to one week.